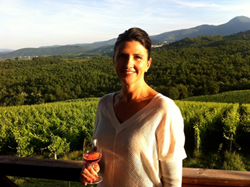 Columbia Winery has announced Certified Sommelier Shelly Fitzgerald as the Winery’s new Wine Education Specialist. A California native, Shelly began her career in the wine industry in London, where she briefly lived abroad with her husband and young children. Here, she enrolled in the Wine & Spirits Education Trust, learning all she could as an apprentice under a wine shop owner. In 2010, Shelly moved to Seattle and worked as the New World wine buyer for Wine World and Spirits, and then worked as sole wine buyer for Downtown Spirits. Since moving to Washington, she has truly enjoyed getting to know the great diversity offered in the state’s wines, as well as the people who grow and make it. Earlier this year, Shelly accepted a role as the Wine Educator for Columbia Winery. As such, Shelly is responsible for teaching visitors to the tasting room about the Winery’s offerings, as well as Washington wine as a whole – a task she is excited to take on.